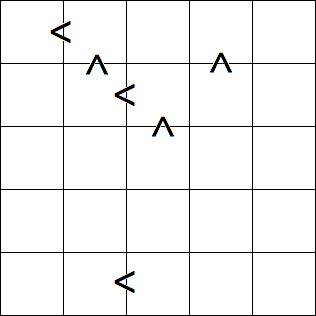 What is the minimum number of clues for $5$x$5$ Futoshiki puzzle having a unique solution? Each number and each sign is a clue. To provide a starting point: The following puzzle with 6 clues should be uniquely solvable. This was mostly found by trying out different strategies. The basic idea was starting with a chain of 4 signs to get 5 numbers. The chain was constructed to put the numbers in as many different columns and rows as possible to provide the most restrictions to the puzzle. This leaves us with a column and a row with 3 numbers already determined. For each of those a sign was added to be able to deduce the order of those two missing numbers while also providing a clue for one other number. Thus each of those signs immediately gives us 3 new numbers and are together enough to solve the puzzle. Not the answer you're looking for? Browse other questions tagged logical-deduction optimization puzzle-creation grid-deduction or ask your own question.